Yes, another unscheduled post that I just had to write. Before getting to the wacky power of the day, I also thought I’d mention that the Comics Bulletin has an advance review of Daredevil: Blood of the Tarantula up. Oh and this is my 50th post. Yippie! (Pats herself on the back). Tonight I’ll be out celebrating, not because of this dubious accomplishment, but because today is Valborg, a big “party holiday” in my little corner of the planet. Okay, below is another panel from Daredevil #28, which I already mocked in my previous entry. 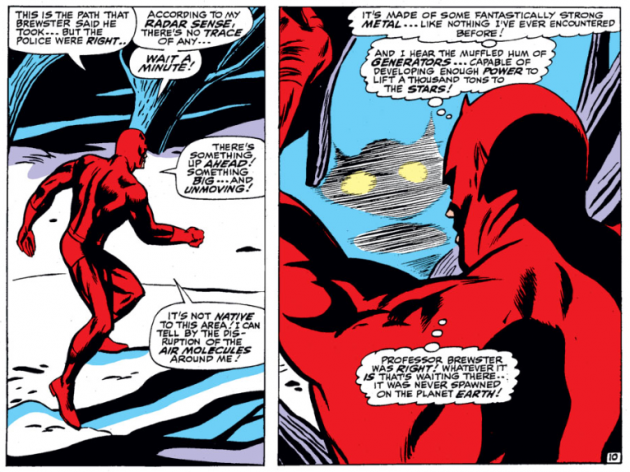 Here we see Daredevil approaching an alien space craft and making some pretty educated guesses. This again illustrates the beauty of having a hero who can magically do things by “sensing” them, although we are left guessing how this is supposed to work. Congratulations for your 50th entry! The Daredevil of the silver age surely had some powerful hypersenses. He didn’t even need a closer look or confirmations. His first impression of something – no matter how unusual, or complex or unearthly – was always exactly the thing he had detected. He could always state with certainty that he was in front of an alien spacecraft made of indestructible metal, or an island rich with prehistoric vegetation or an android that could be remotely detonated.